The condition of the thirtysix sharp keys of a piano is important first and foremost in that it affects the appearance of the keyboard as a whole. Whether your piano is a vintage instrument with ivory naturals and ebony sharps or a more recently built piano with synthetic naturals and sharps, noticeable wear and tear of the black keys detracts from the keyboard as a whole. In extreme cases, severe wear and tear of the sharps may even affect performance, in that the uneven shape of badly rounded sharps can become a distraction during play. If the sharps keys on your instrument are badly worn, either replacement or refinishing would certainly enhance the appearance of the keyboard of the piano, and would possibly even make playing the piano more pleasing. How do I decide whether it would be better to replace or refinish my piano’s worn set of sharp keys? Many times the replacement of an old set of sharp keys is the best solution. If the wear and tear is more than surface deep, particularly if the corners (or the facets) of the front of the sharps are noticeably rounded, they should most likely be replaced with either new plastic or ebony sharp keys. 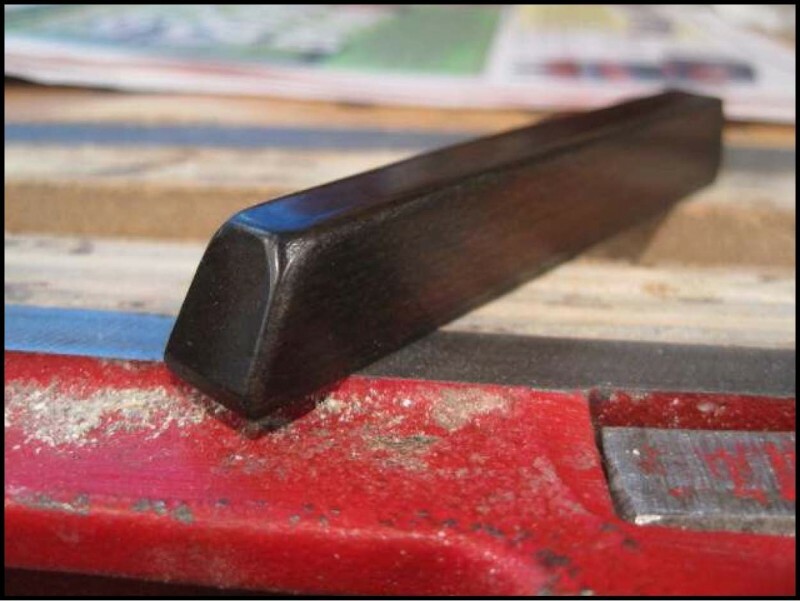 If, however, the original sharps prove to be genuine ebony (or pearwood) and are not overly rounded from wear you may want to consider the option of stripping off the old finish (above photo) and having them refinished. Sprucing them up and reusing them might make sense. Aren’t the sharp keys of older instruments all basically made the same? No. With vintage pianos there is a distinct difference in the quality of the woods used for the manufacture of sharp keys. 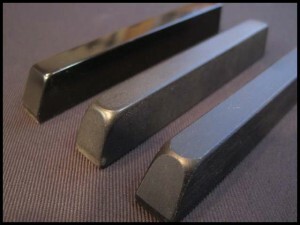 Better quality pianos were more likely to have genuine ebony sharps (left example in photo), or a high quality hardwood such as pearwood, dyed to take on the appearance of ebony (second from the left in photo). Lesser quality pianos would more than likely have a white wood or other cheap wood thickly lacquered to disguise the inferior nature of the product being used (right hand examples in photo). 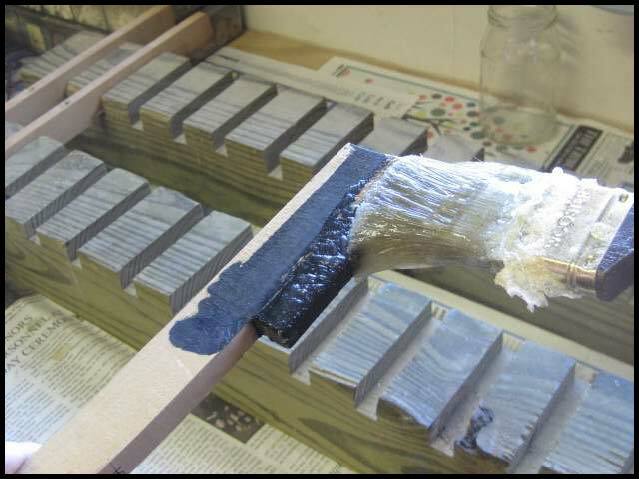 If the wood does prove to be ebony or a quality wood such as pearwood, and the facets are still clearly defined, refinishing is an option to consider, although it needs to be understood that the amount of time needed for the repair will almost certainly be longer than for the simpler job of replacement. 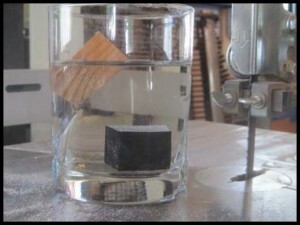 Why does it matter what wood was used if they are all black, or at least treated so that they are black on the outside? In a word, durability. Ebony is one of the most resistant woods to wear and even after decades of use, will oftentimes show very little effect from the countless fingers that have made contact with its surface. 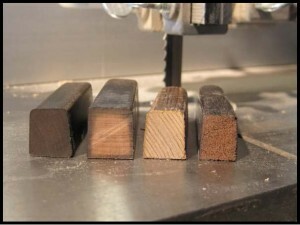 Pearwood is a very durable substance as well, much more so than any whitewood.Ebony’s extreme durability is due to the fact that it is one of the densest of woods, having a high silica content which makes it very heavy in comparison to ordinary woods (it actually sinks in water—photo left.) 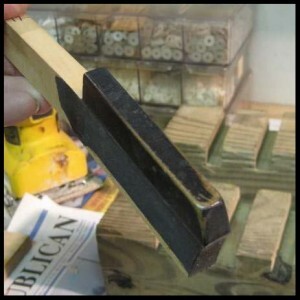 Because of this characteristic of the wood, ebony sharps (and pearwood sharps as well) are less likely to become rounded on the front from wear than those made from cheaper woods. If the sharp keys of my piano are not worth saving, what are the options available for replacement sharps? Most commonly, plastic sharp keys are used to replace original, wornout sharps. Plastic sharps are available with either a satin or a highgloss finish. New ebony sharps are also available for purchase from piano supply houses at a considerably higher price (10X) than the plastic versions. When the old sharps are replaced with a new set, what is the procedure used? Each key is first removed from the piano. The “sharp” is just the top, visible portion of the key, which is glued to the basswood keystick. 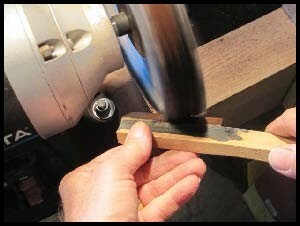 The basswood keystick is then secured in a woodworking vise, so that only the sharp is exposed. The sharp is tapped with a mallet to remove it, leaving the upper surface of the keystick exposed. The new sharp is glued to the keystick with a special adhesive which will stand up to decades of use. Precise placement of the sharp key on the keystick is essential and is carefully done. For replacement sharps is genuine ebony worth the additional cost? Although there is a discernible difference in terms of outward appearance between highgloss plastic sharps and ebony sharps, the difference is less between the satin finish plastic and the ebony. In the photo below the sharp closest to the camera is real ebony. The other two are satin and highgloss plastic, respectively. 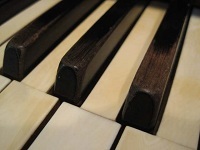 Some pianists prefer the feel of the natural ebony over that of plastic, but it is a subtle difference. Most new pianos have plastic sharps, so for many people it’s a very familiar feel. If you appreciate fine vintage instruments, and if your piano has original ivory naturals in good condition, it would be nice to be able to say that the piano has genuine ebony sharps as well. If the original sharps are in fact ebony with facets which are still clearly defined, are there reasons to put in the extra time that refinishing must take? There are a couple of good reasons. First of all, by reusing the original ebony sharps you are helping to conserve a diminishing resource. 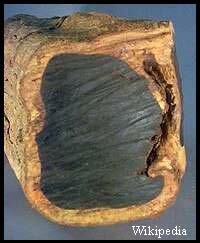 Ebony is a rare commodity (photo shows a crosssection of an ebony log), and is considered a threatened species in Africa, India and Indonesia, where it grows wild. Secondly, by restoring the original sharps, you’re preserving some of the history of a piano which was built in a time when the raw materials we now consider luxuries (ivory, ebony, exotic veneers) were in abundance, and corners were not as likely to be cut in order to save money. If the sharps are to be reconditioned, are there options as to finish? Yes. With ebony sharps, some pianists prefer the natural feel of the wood. When polished (photo) ebony has a luxurious silky feel. While some ebonies are almost pure black, others may have deep reddishbrown or dark grey hues. If a solid black finish is preferred, an opaque black lacquer may be applied over the wood. This is what traditionally was done, and is noticeable only when the lacquer starts to wear, revealing the true wood tones underneath (see cover photo). Are there any other final considerations? Whether the worn sharp keys of your piano need replacement or refinishing, attention to the repair will pay off in the appearance and touch of your keyboard. 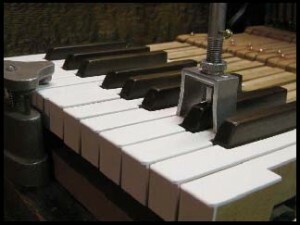 Having your newly refurbished set of keys leveled (photo) and the action regulated will bring the performance of your piano in line with its appearance. A vintage ebony sharp after stripping and polishing—the warmth of real wood.